Across the United States, 1,455,857 people (or 463,649 households) lack complete plumbing. That is 0.39 percent of the population. If all of the people without complete plumbing congregated together, the population would be the size of Phoenix, Arizona. The U.S. Census Bureau defines complete plumbing facilities as (1) piped hot and cold water, (2) a flush toilet, and (3) a bathtub or shower, all located within the housing unit and used only by occupants. As of 2016, the majority of households without complete plumbing lacked all three amenities or just hot and cold running water – both 29 percent. A large proportion also lacked just a bathtub or shower – 15 percent. 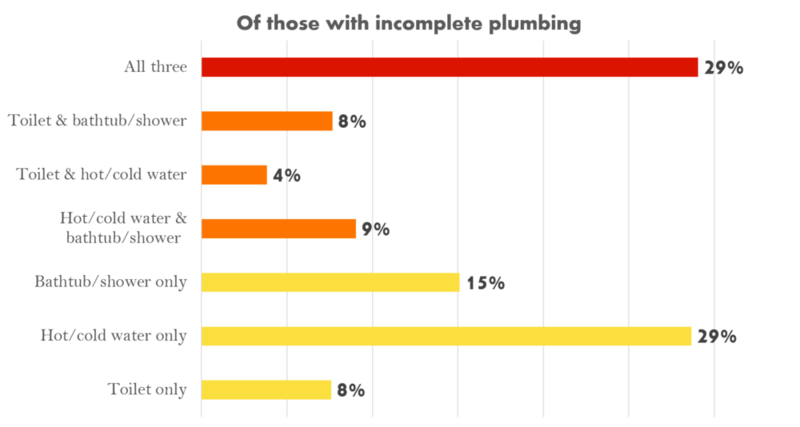 One widespread myth is that the majority of those with incomplete plumbing only lack a flush toilet but the data do not suggest that. Rather, the majority of the plumbing poor in America lack all three amenities. where do people lack complete plumbing? First, despite what you may think – these households are not mostly in rural areas - only 9 percent are. This dispels a widely held myth that most plumbing incomplete households are in hard-to-reach rural areas. Seventy-three percent of these households are in large metros. As you can see – the urban-rural distribution of plumbing incomplete households is very similar to overall population trends. 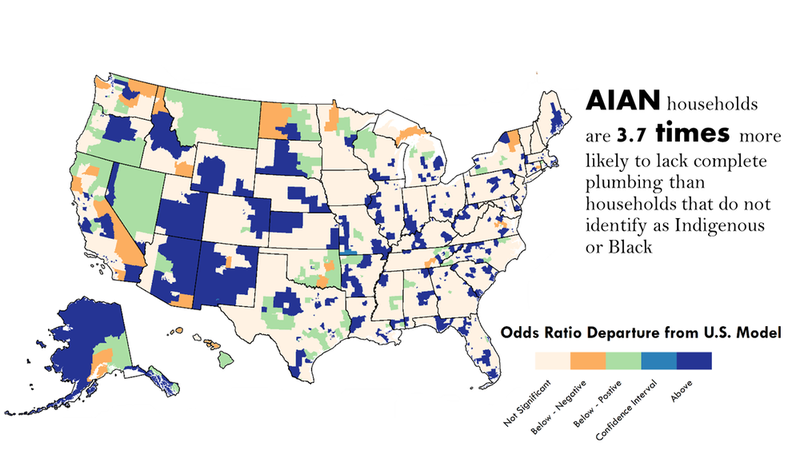 Households with incomplete plumbing are not randomly scattered across the US. Rather they are clustered in particular areas. The map below shows the number of households within a given area without complete plumbing. The Four Corners region - the location of a large Navajo Reservation stands out. Importantly, these maps show that plumbing incompleteness is not spatially random. These patterns are only apparent because we have zoomed out to look at the entire country. The aggregate number of plumbing incomplete households across the United States is small enough to seem insignificant – 0.39 percent. However, 73 percent of the population in one neighborhood in northeastern Arizona lack complete plumbing - a major cause for concern that is hidden if we don’t pay attention to the geography. Race and ethnicity are significant predictors of plumbing incompleteness across the 117,716,237 households in the United States. Living in an American Indian or Alaska Native (AIAN) household increases the odds of lacking complete plumbing 3.7 times nationally. Black households are 1.2 times more likely to lack complete plumbing than households not headed by someone who is black or indigenous and Hispanic households are 1.2 times more likely to lack complete plumbing than non-Hispanic households. Many people assume that one of the major factors is housing type. In fact, one major myth is that most plumbing incomplete household are mobile homes. Our results suggested that it is a strong factor, although not the only one. Those living in mobile homes are 2.5 times more likely to lack plumbing than households living in non-mobile housing. More interestingly, renters are also more likely to lack complete plumbing. Those that rent are 1.4 times more likely to lack complete plumbing than those that own their home. This is alarming because renters have relatively little control over the conditions of their housing particularly in cases where it is all that they can afford. Those living in mobile homes are 2.5 times more likely to lack complete plumbing than those that don’t live in mobile homes. As you might expect, households with incomplete plumbing tend to be lower income. Accounting for race, housing type, and tenure, as household income goes up the odds of lacking complete plumbing go down. The most striking of these national results are the trends based on race and ethnicity. Plumbing incompleteness is not randomly distributed across the population - rather, Indigenous, Black, and Hispanic households are more likely to lack complete plumbing than other households. This is true even across equal income brackets, and housing types. This is America. These patterns suggest at the depth of inequality. Plumbing - both invisible and assumed to be universal - is more likely to be available to certain populations and race matters in predicting who lacks this infrastructure. how does the 'who' of plumbing poverty change through space? Here are the results of the PUMA household regression analyses. As you can see, the regression results are spatially varying and blanket statements based on national data do not capture the full picture. For example, recall that nationally, Indigenous households are 3.7 times more likely to lack complete plumbing than households that are not native or black. However, as you can see on the map below there are areas in orange where living in an indigenous household increases the odds of having complete plumbing. And there are areas in indigo where living in a native household increases the odds of having incomplete plumbing more than 3.7 times. There are also numerous areas – in off-white – where living in an indigenous household is an insignificant factor. Here I want to highlight how race and space interact. On these maps (below), a hot spot – in red – is an area where the local odds ratios are higher than the global patterns and the difference is too great to be the result of random chance. Cold spots (in blue) are areas where the local odds ratios are significantly lower than one would expect given random chance. These results are really important because they suggest that there is a social geography of plumbing inequality. Race undeniable matters in identifying households without complete plumbing across the entire United States as the national logistic model suggested however those patterns are stronger in particular areas of the country and insignificant in other areas. The promise of universal public infrastructure in the United States is an incomplete promise that is not socially or spatially random. We need rigorous geospatial methodologies drawing on large datasets to see that. More work needs to be done to understand further how this has come to be, what it means for the daily lives and health of households without complete plumbing, and what might be done to fix the issue.